FIFTY special edition 650S cars, priced around BD138,000 (£244,500) each, are being built to celebrate the 20th anniversary of the 1995 24 Hours of Le Mans race which witnessed five McLaren F1 GTRs crossing the line to finish 1st, 3rd, 4th, 5th and 13th. In honour of this achievement, five special editions of the McLaren F1, badged the McLaren F1 LM, were commissioned – one for each of the cars that finished. This year McLaren Motors will make 50 McLaren 650S Le Mans available globally, with a design inspired by the race-winning car. Designed by MSO in consultation with Peter Stevens, the designer of the iconic McLaren F1, the McLaren 650S Le Mans will be offered as a coupé only, and will borrow a number of styling enhancements from the iconic original, most notably the roof-mounted ‘snorkel’ air intake. The unique ‘Le Mans Edition’ lightweight wheels – 19-inch at the front, 20-inch at the rear – are styled around the design of the motorsport rims fitted to the 1995 racers. The rims wear the McLaren-developed Pirelli P Zero Corsa tyres and are mounted in front of carbon ceramic brakes as standard, with McLaren Orange callipers. Mr Stevens explained: “The design of the McLaren F1 rewrote the rulebook. It was intended to offer the ultimate, no-compromise road-driving experience. The fact that it was transformed into a racer, and a race winner, was true testament to the strength and integrity of the original design, which is something I am very proud of. Power and torque figures for the McLaren 650S Le Mans remain unchanged from the standard production model, producing 650PS (641bhp) and 678Nm (500 lb ft) of torque. This sprint from zero to 62mph is achieved in three seconds and the top speed is 207mph. Visual carbon fibre features throughout the limited edition model, including the front splitter and rear bumper. The limited edition coupés also feature MSO-developed extended side blades and the distinctive MSO rear diffuser. 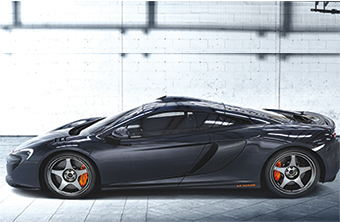 The unique look of the McLaren 650S Le Mans exterior is further enhanced by the metallic Sarthe Grey exterior paint colour, inspired by the colour of the race-winning McLaren F1 GTR. A splash of the famous McLaren Orange in the form of the ‘Le Mans’ logo adorns the wheels and the trailing edge of the extended MSO door blades, while an internal dedication plate on the door card identifies the limited nature of the model. The interior is swathed in black leather and Alcantara, while a pair of sports seats are finished in black with contrasting McLaren Orange Alcantara in the centre. A Le Mans logo is embossed on the headrest of each seat, and on the unique floor mats, paying further homage to the anniversary. Deliveries of the McLaren 650S Le Mans will commence in mid-2015. Buyers will receive an exclusive invitation for the owner plus a guest to join McLaren at a 20th anniversary celebration of the famous victory at the historic Le Mans circuit. McLaren Motors is partly-owned by Bahrain’s sovereign wealth fund Mumtalakat.